Every year I try to “mix things up” with the decorations I have on hand. I do have approximately 50 large containers and boxes of Christmas decor..
~ ~ not to mention trees, wreaths and garland. 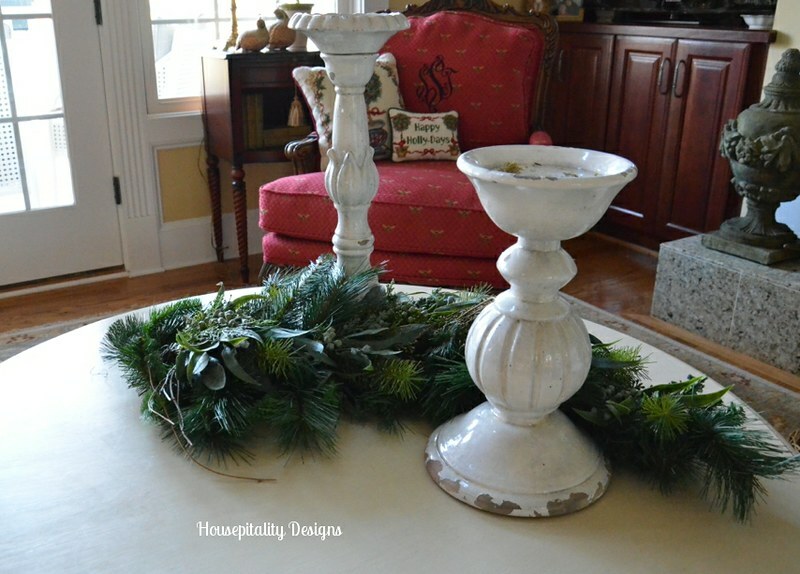 I have a great inventory collected over the years to choose from ~ ~years of “after Christmas sales”! As I do with accessories during the year, I am changing the “geography” of my Christmas Decor. 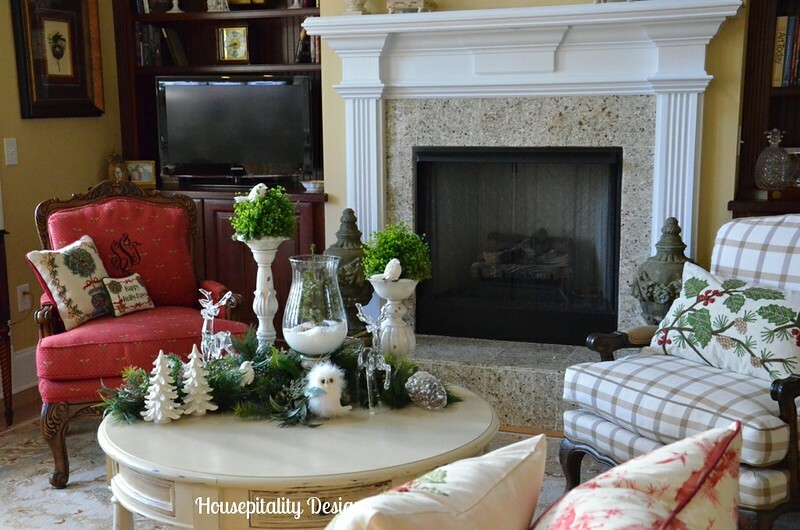 I decided this year that I will use a softer palette of white, silver and green in the great room. 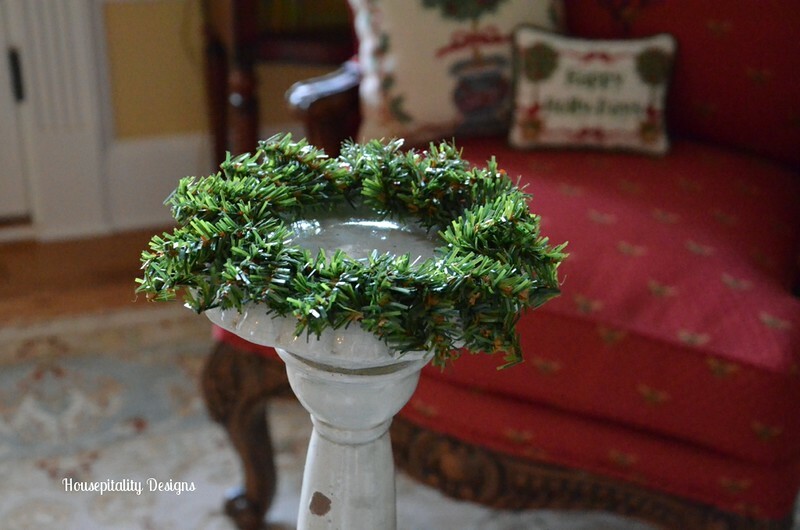 I began with the Pottery Barn candlesticks and a faux evergreen swag. I placed a mini faux wreath at the base of the platform.. 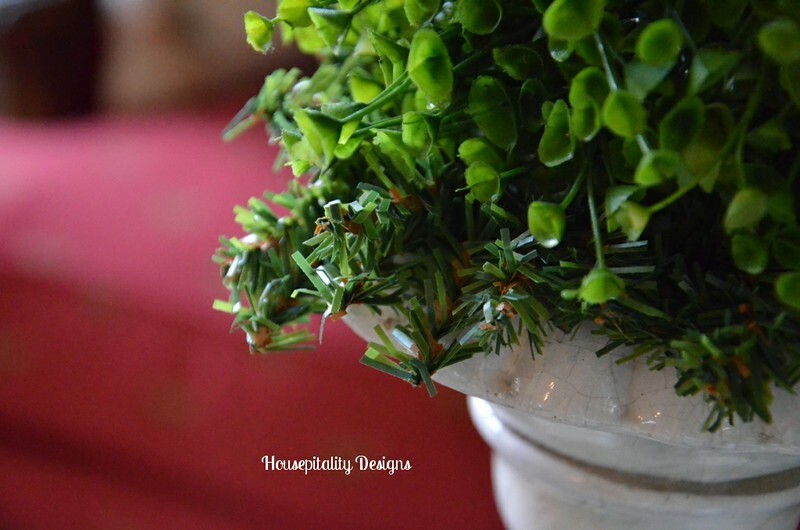 I love creating arrangements and experimenting with different textures. A great place for a winter bird to perch. 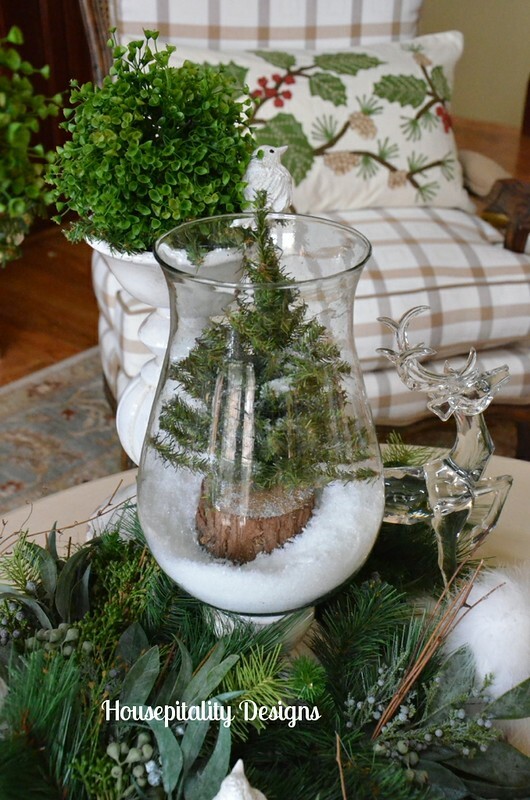 Placed a faux evergreen tree in the Pottery Barn Leah Hurricane..
~ ~ I use Department 56 faux snow as it is very fine and more realistic. 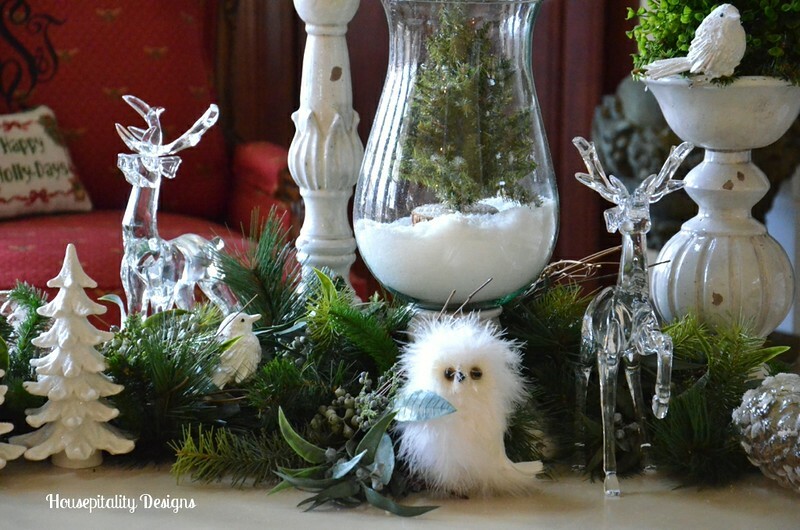 Added crystal deer, ceramic trees by Raz, and a cute owl. I added two clear glass pine cone ornaments that have twigs inside..
~ ~ I love the texture that the twigs bring to the ornament. 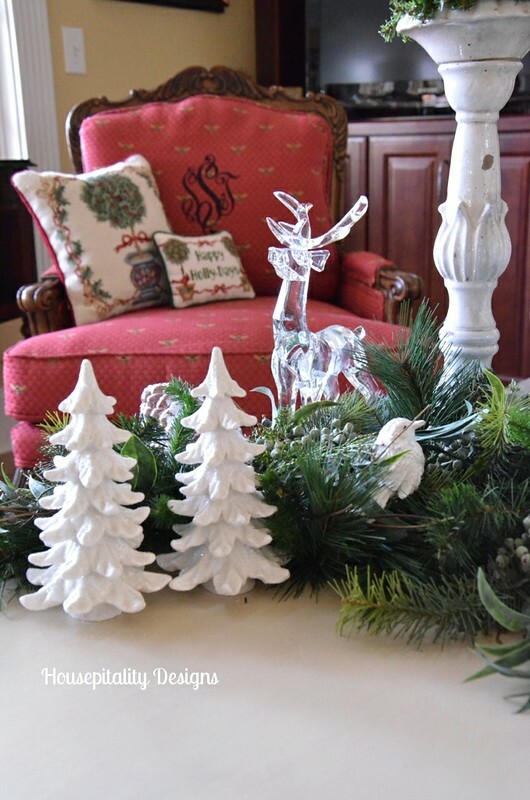 One Christmas vignette done….many more to go! Shirley, this is wonderful! I love the wintry style! The tiny owl is just the cutest little guy! The tree in the globe is so clever- great vignette! I love this Shirley! Your green and white woodland scene is beautiful! We have a section of the basement that sits under the hearth room, so it is the same size as the hearth room. That is the Christmas corner. :-) I gave the kiddos quite a few things last year, so my supply was depleted. I was trying to be practical and downsize the decor. Well…I added two new trees this year and a few other little tidbits…so much for downsizing. I love Christmas decorating and try to change things up every year, too. 50 Boxes….WOW! With that quantity of stuff you can mix and match for years. It is no surprise to see that you are off to a good start, and I so look forward to what else you do. When you finish at your house, feel free to come here! It looks magical, Shirley. I have years of after-Christmas sale decorations, too. Decorating will go into full swing as soon as our last guest leaves Thursday evening. Beautiful ! Love the topiaries and the hurricane.. 50 large boxes ! Wow ! Very pretty. I like the simplicity of it I am feeling a little stressed as I view your progress. Just got home from 2 weeks in Florida and I can’t start until Friday (my tradition). I LOVE your wintery vignette, the little reindeer is so pretty! I can’t wait to see more…..50 containers is a whole lot of pretties!!!!! Beautiful! Love the green and white. I wish you could come to my house and help me look at my collection of Christmas decorations with a fresh eye. I just love this! 50.boxes.oh.my. That’s fantastic! Can’t wait to see what else you do! so pretty, love your soft and easy color scheme. It’s so hard for me to come up with a new way to do things, love your ideas! Beautiful vignette! 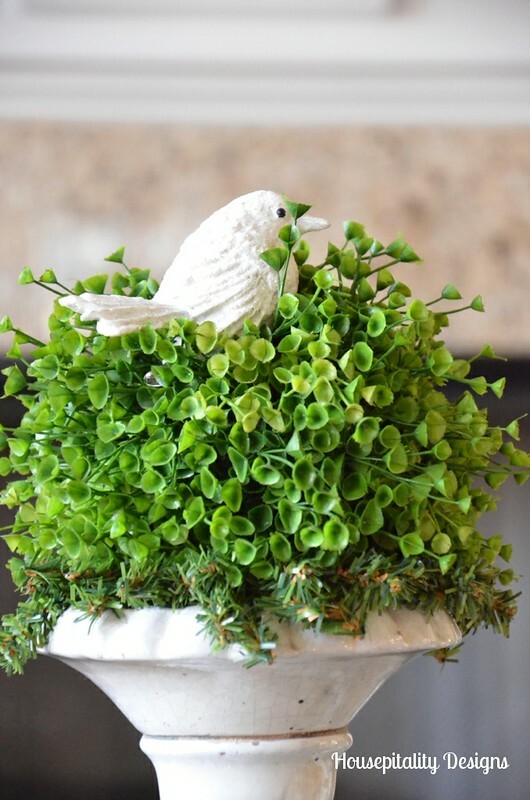 Love the greenery and white together. It really does say winter! Shirley, I like your vignette – it looks so fresh and welcoming. Thanks so much for sharing this – gives me ideas. Shirley, this is so pretty and wintry! I love popping in to see what you have been up to. Your woodland vignette is gorgeous! I’ll have to live thru you this year…lol…my Christmas is going to be very lowkey, with this reno going on. I know you’ll keep my in the spirit! Shenita’s recent post…Let The Fun Begin! So pretty- love the colors! 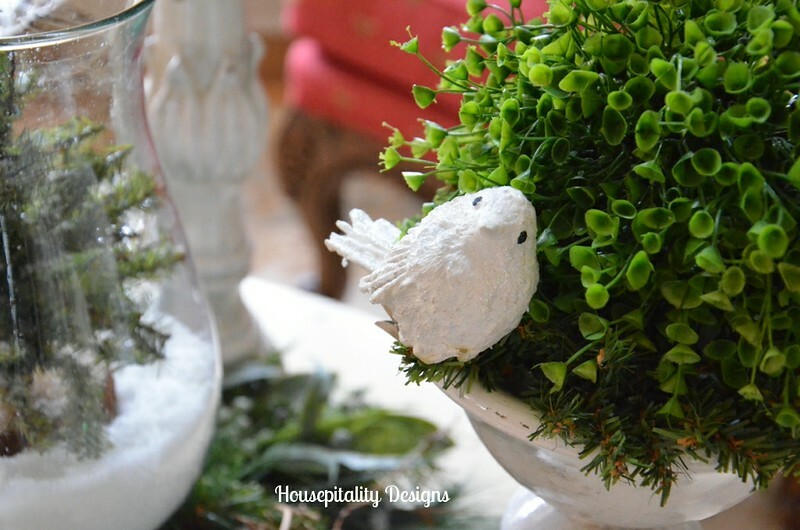 The topiary and birds are so sweet! I do the same as you- mix up the geography of where the items get used. I’m so glad to know other people have a large storage stockpile like I do! 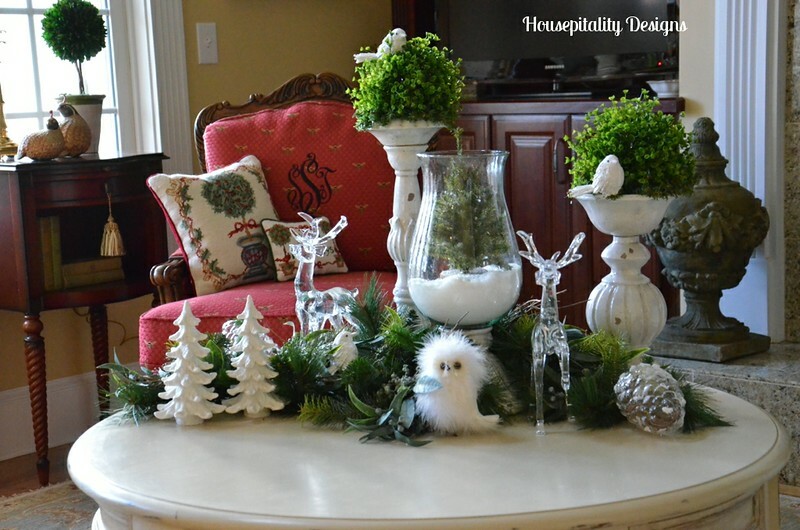 What a great nature themed vignette, Shirley! I love that owl! Adorable. I love those topiary balls, too. I think they can work great throughout the year. I have a couple myself that I just seem to incorporate all year long. Wow! 50 bins…I thought I had a lot, but you have got me beat! I’m using green and silver this year for the first time…had been using greens, browns and cream. I love changing it up every year….keeps things interesting! Can’t wait to see what else you do! Shirley this is a pretty vignette. It could be left up all winter. I noticed the pillows on your chair, they are very pretty. You’re so right about the Department 56 snow! It’s the best!! I love love love the white and silver and green. So pretty. Love it all! So beautiful and I love your Bee print fabric on your chair. Where did you get the Bee fabric? It is a Robert Allen fabric…(Napolean Bee) Chair made by Flexsteel and purchased at Furniland South in High Point, NC. 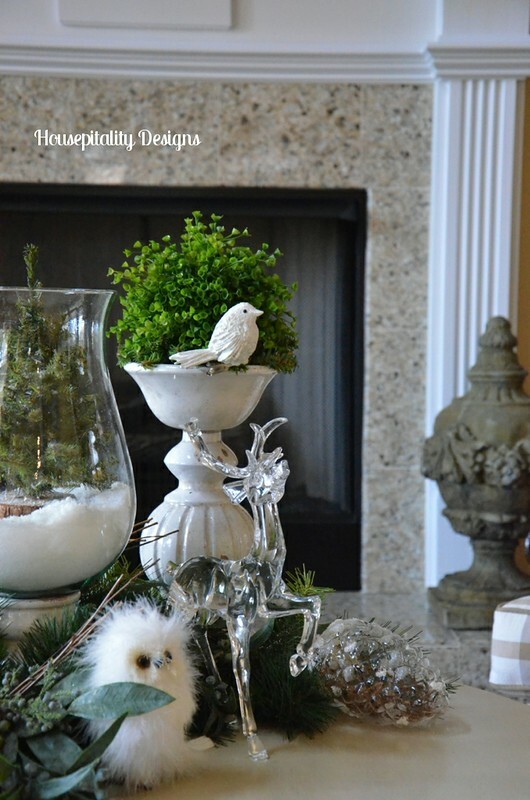 Hi Shirley~ I love the simplicity of the white and green with your adorable snowy owl! 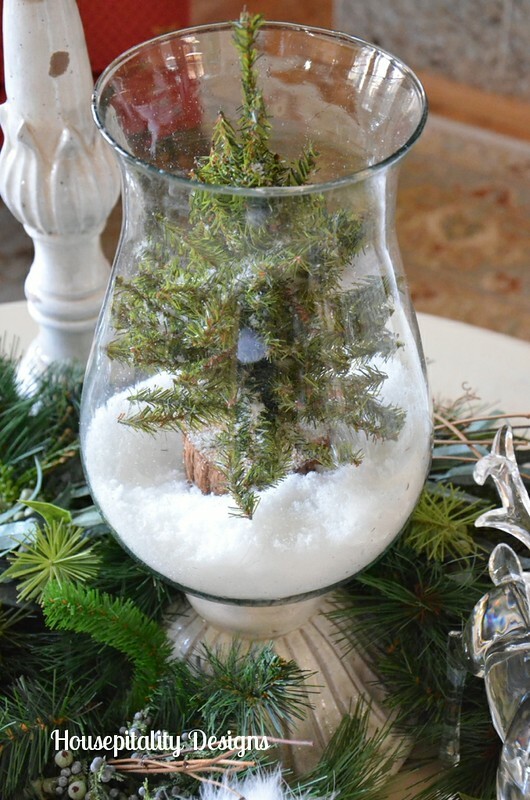 The snow in the hurricane with the tree is such a fun and festive touch. Thanks for the tip of Dept. 56 snow. I have yet to start Christmas decorating, I’m still in Thanksgiving mode, but I don’t have 50 bins to tackle either, LOL. I think I would have started November 1st if was the case 🙂 It’s cold and rainy so it’s a good day to stay inside and decorate! Wishing you and your family a Happy Thanksgiving! Very pretty, I love white & green together! Have a happy day Shirley!